8 Channel Distribution Amplifiers DA1-8HLDA1-8 Manual – including circuit descriptions, typical performance, circuit diagrams and PCB overlays etc. You will also need to refer to the DA1-4 Manual. 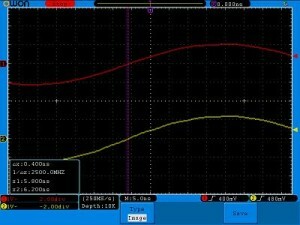 The DA1_8 provides an 8 way split from RF input signals from well below 1MHz, up to around 12MHz with the installed Low Pass Filter. 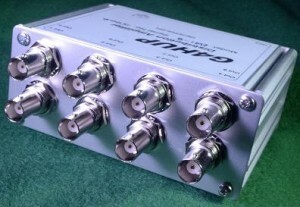 Note that all DA1-8HL units are supplied with Low Profile BNC sockets. 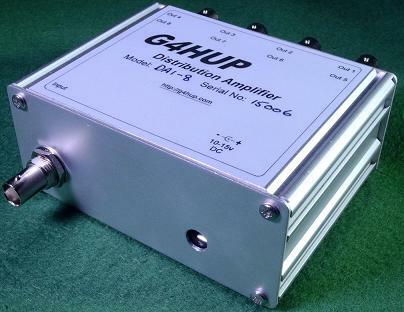 There is no RF version of this amplifier. 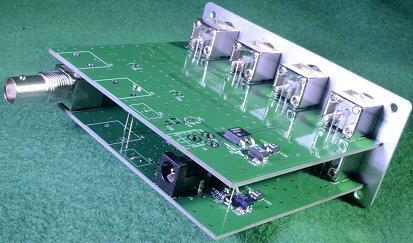 The performance of this amplifier is based on the known performance of the DA1-4 sub-units on which it is based. The oscilloscope plot above shows that the difference in output phase between outputs on the lower PCB (out 1 to out 4) and those on the upper PCB (out 5 to out 8) is very small – typ around 1.5 degrees, and is well within the variations that could be experienced across a single bank.